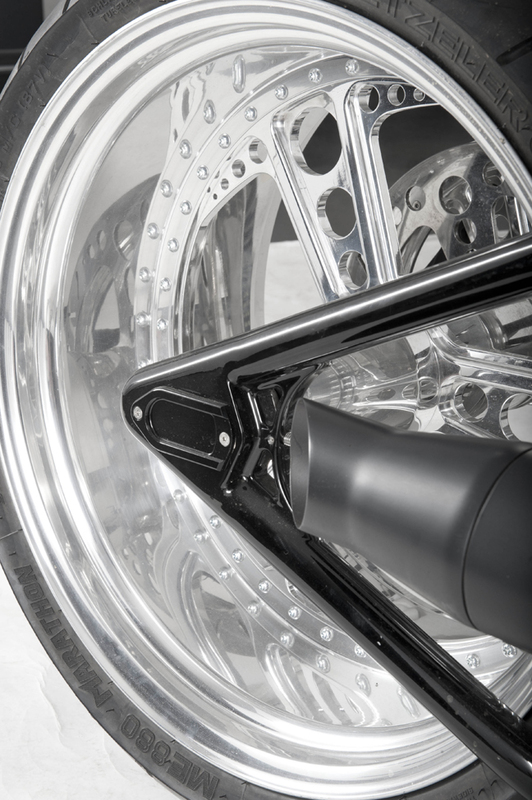 Our 280 / 300 tire motorcycle swingarm kits are bolt on replacements for the stock 1991-99 Harley Softail swing arms and they enable you to mount a 280 or 300 tire on your stock Evolution Softail without doing any modifications to the frame. These 280 / 300 tire motorcycle swingarm kits can be installed only in conjunction with a 20mm secondary belt and can fit up to 10.5” wide rims. Thanks to this innovative wide swingarm you will be able to mount a super-wide rear tire, without any modifications to your stock frame, still keeping front and rear wheels properly lined up for safe riding and great handling. Sorry, but there are not more pictures about the custom bike featuring our 280 / 300 tire motorcycle swingarm kit for Softails. 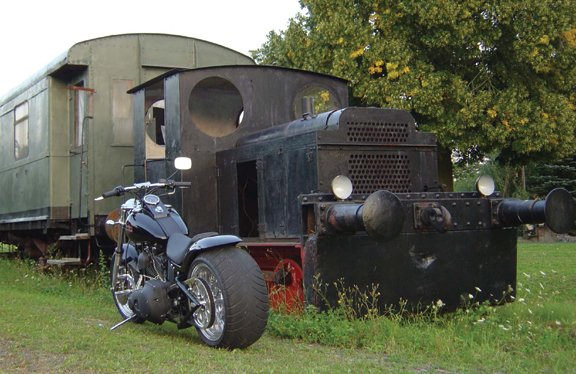 The bike is a stock Harley-Davidson Softail, the only parts that were replaced are the wheels, rear fender, T bar and of course the wide-tire swingarm. 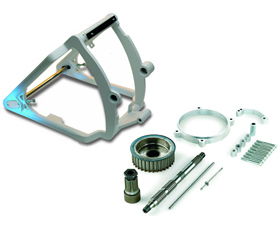 Can I use this swingarm kit in my Rocker C 2010 just replaceing wheel tire and fender? No other modification? 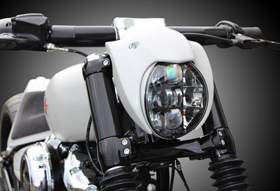 Thank you for your interest in Eurocomponents’ custom motorcycle swingarms. Yes, our 280 / 300 tire swingarm kit for Softails can fit your 2010 Harley Rocker C no problem. Please note this kit can be installed only on chain primary drives with a 1-1/8” secondary belt (which will run outside the frame). For clearance needs it must be installed in conjunction of aftermarket rear caliper and bracket. It can fit up to 10.5” wide rims. Hello what is the price of 280 tyre for night train 1999 belt? How much to ship to Australia? What does it include? Kit inludes: swingarm, axle, pivot shaft, complete primary offset kit with bearings and all necessary hardware (basically everything you see in the pictures above). Lorenzo, does it also fit my 1991 FXSTC ? Thank you for your interest in Eurocomponents’ motorcycle swingarms for wide tires. Yes, we have 2 different fat tire swingarm kits: one for pre-1999 Harley Softails and one for 2000-up Harley Softails. I’m considering making a bobber with my 05 883 iron would appreciate any advice and experience in parts . I want a heavy looking front 190 or 200 tyre. 280 rear. Single seat all black. Thank you for your interest in Eurocomponents’ motorcycle wide tire swingarms kits. Sorry, but we do not offer extra wide front forks. If I remember correctly there is a company in the Netherlands making them, it is called SJP, which used to be distributed in the US by Russell Mitchell’s Exile Cycles. Check them out. Unfortunately we also do not offer a 280 tire swingarm kit for Harley Sportsters, In this case we really do not know where to address you or even if it is possible to mount a 280 rear tire on a Sportster. How much for the conversion kit 280/300? 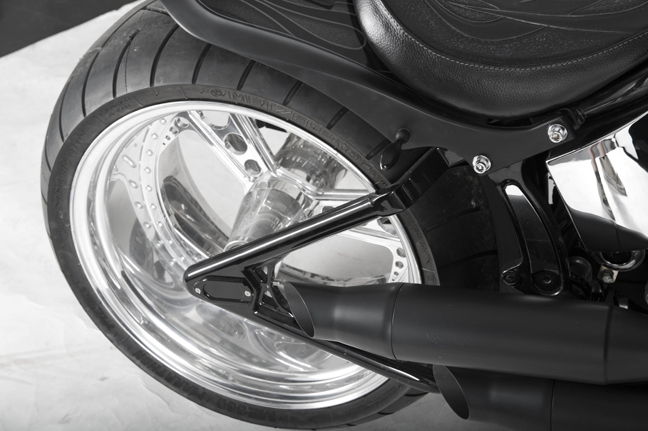 Thank you for your interest in Eurocomponents’ softail wide tire swingarm kits. To get pricing, just click on the BUY NOW link above the pictures. 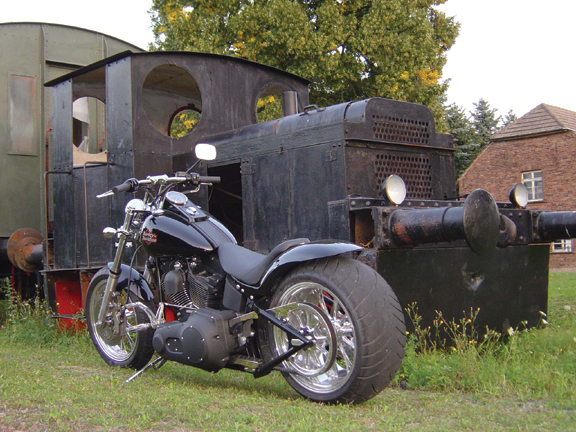 Yes sure, our swingarm kit for 300 tires can fit also your 2011 Harley Fat Boy. Will this kit fit a 2015 Harley breakout? Yes we have specific swingarm kits for 300 tires to fit also the latest Harley Softail models, like your 2015 Harley Breakout. Can I use this in my 2015 sportster? What will happen to the shock absorbers? Thank you. Thank you for your interest in Eurocomponents’ wide tire swingarm kits. No, this swingarm is just for Softail models. Sorry, but we do not have any swingarm kit for Triumph’s. Hello, I’m looking to buy a 280/300 rear tire kit for a 2002 Harley Davidson sportster 883 , does your company see this? Everything we offer is listed on the website. Thank you for your interest in Eurocomponents’ wide tire swingarm kits for Softails. Yes, we make a 300 tire swingarm conversion kit for Harley Davidson Breakout’s. 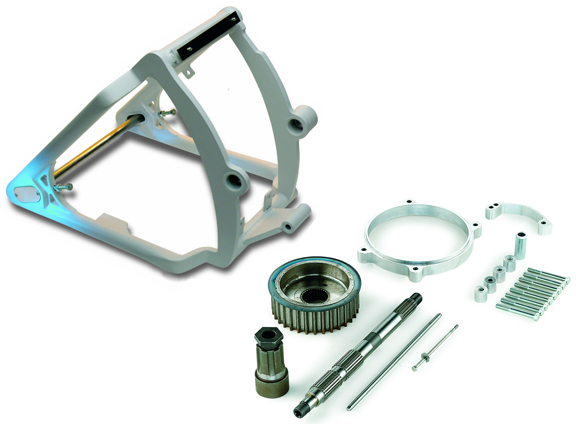 The swingarm kit includes swingarm and pimary offset and is a bolt-on item (no frame modifications are necessary). The version for 2014-up Breakouts can fit your bike no problem. Kit consists of swingarm + complete offset kit. Wheels, rotors, rear pulley or fender are not included. Just wondering if you know what size tires and wheels were used in the pictures above front and back, with the swing arm conversion kit. The pictures I am referring to are the ones with the train in the background. Front wheel is 18×3.5 with a Metzeler 130/18 tire. Rear wheel is 18×10.5 with a Metzeler 300/18 tire. Thank you for the reply. 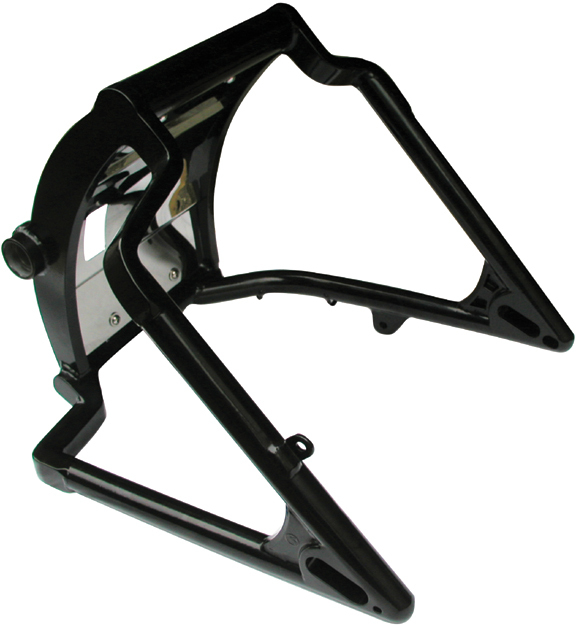 If I purchase the 300 tire motorcycle swing arm kit for my 2005 Harley Soft tail FXSTI how much would that cost? I would also like to know where to get the exact rear fender and seat pictured as well. Is that something you sell? if not can you tell me where to purchase it? Thanks again, Tim. Please note kit includes swingarm and primary offset kit (it does not include belt, wheels, rear pulley, rotors, tires or rear fender). Sorry, that was a customer’s bike and we do not know who manufactured the rear fender and seat. Sorry, but we offer only swingarm kits for Harleys and Yamaha Roadstars. I wanted to buy a fat boy I believe from 2007 and on they made the fat boy with 6 speed and I wanted to switch out the swing arm for a 300 kit, is there a kit for only certain years, or you can make one for 2007 to present, any suggestions!!! All different versions listed have some differences. The best way to make sure you will get the right 300 tire swingarm for your Fat Boy is to give us the VIN number. I have a 1990 Fat boy wanting to know if you guys can supply me with a 300 rear swing arm kit ? also is this the widest you guys door can I get a wider kit to suit my fatboy??? Yes, we can make a 300 tire swingarm to fit your 1990 Harley Fat Boy, just pick one from the listing above the pictures. I just picked up a 2013 softail deluxe will your 300 swing arm fit? 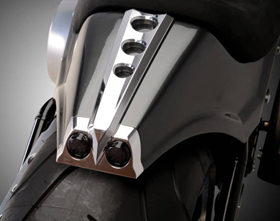 Yes, we can make a 300 tire swingarm to fit your 2013 Harley Softail Deluxe. Hi, I have a 2016 breakout and want to put a 300 wide tire on it. What is included in the Kit? does it require a second belt to be run? Could you email me the installation instructions so i can see what is involved before i commit to buy? It does not include belt, wheels, rear pulley, brake calipers, rotors, tires or rear fender. I will e-mail you mounting instructions in a minute.